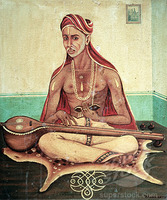 We are glad to share the Tyagaraja Kriti “Aadamodi Galade Raamayya”. In this Kriti Tyagaraja pleads to Lord Rama just to talk to him. He says that he has taken refuge in Lord Rama’s divine holy feet with devotion. He then sarcastically says that Lord Rama did not even talk when Hanuman met for the first time. Instead of talking directly to Hanuman he conveyed his brother Lakshmana to enquire about him. Tyagaraja says if such is the case to the mighty Hanuman himself will the Lord listen to this Poor fellow rather in a mocking way. Let us hear this beautiful song sung in Charukeshi raga sung by M.S. Amma. The Lyrics with meaning and the audio link is shared in the following link. Have a Great Sunday and Wonderful Week Ahead. O Ramayya! Is it fair to be Obstinate to talk to Me? I have considered You as the sole refuge and holding on to your divine holy feet with staunch devotion. When Hanuman the one who is born to the Wind God, the one who is proficient in all shastras, who is considered an off shoot of Lord Shiva himself, offered his respect when he first met, you asked your brother Lakshmana to convey the details to him. This being the treatment meted out to the mighty Hanuman, would you speak to this poor Thyagaraja?